Towards the end of December I got lucky on getting a whole bunch of new skincare products mostly as birthday gifts (I am a lucky December birthday girl) or that I personally purchased. 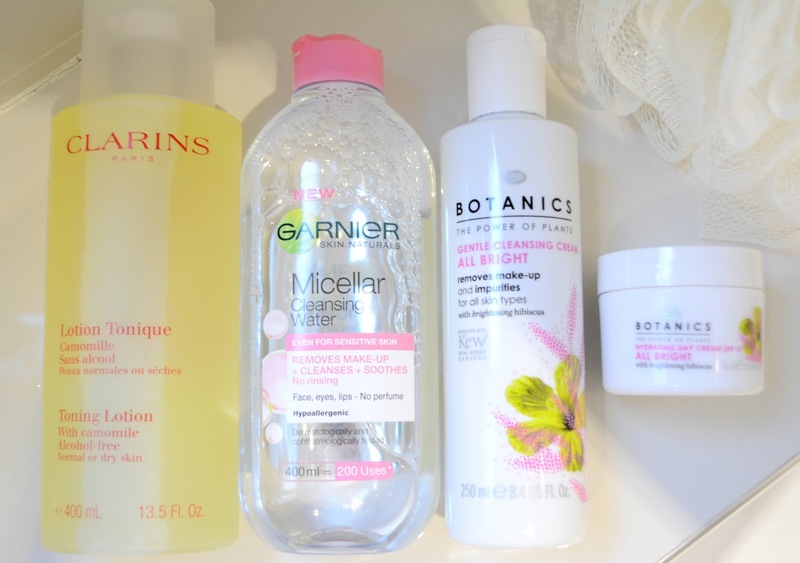 The first one on my list is the Garnier Micellar Cleansing Water. I know these type of Cleansing Water products only recently became very popular in UK but as I am French, living in London, I can assure you they've been available in France already for many years and I always get my hands on a few bottles, usually from Garnier, Nivea or some other French brands not known in this country, every time I visit my family in France. But now, due to their recent popularity, being able to find them here got me really excited. This time around I got the Garnier Micellar Cleansing Water at my local Sainsburys I know perhaps not a glamorous destination but it was half price and you certainly cannot say no to such offer. I am sure you would agree too.My second product is the Clarins Lotion Tonique. I fell in love with this lotion the day I got given a mini sample version, when I visited a Clarins counter a few months ago at Westfield. Since then I have been dreaming of getting the full size version and have been using my mini sample as little as possible so it will last me longer but not any more. Not only this was a gift for my birthday last December, but also I got offered the XL version at 400ml so what's more to ask? Basically this lotion should last me the entire year! I am an happy girl. Lately I got a bit obsessed with the Botanics brand, it's I believe one of Boots own skincare brands. How did I become obsessed? Well for their lovely scents, affordable prices, lovely packaging and since Lily pebbles did a little positive review on one of this product on her vlog I really wanted to give it a go. So when my friend Betsy asked for my birthday wish list I sent her details of the two below products (that she kindly got me along with other surprises): Botanics Gentle Cleansing Cream and Botanics Hydrating Day Cream SPF 15. So here you have it. If you would like a review on all those products please leave me a comment below, having said that I think I would definitely do a review of both my Botanics items. Watch this space.